One day per month is chosen to be on your own and only by yourself to celebrate and meditate. It is like a day off or birth-day but you’re celebrating it differently. By reconnecting with yourself as an insight into the connectivity of the universe one has a path to evolve into a better more successful self. The context:I consider myself by definition inspired by Tim Ferries. His books come highly recommended. I like to believe I am rich in experiences, progressive in outlook and prefer flexibility over routine. I am an entrepreneur, lecturer in prestigious academic institutions and founder of international organizations. I feel busy, I love being busy and I love my job. People ask me while smiling nervously: “With all your projects and demanding occupation, do you sleep? -I do sleep a lot, I might sleep more than you do! Because when you’re happy and successful a good night’s sleep comes easy. -I choose 1 day off I call it the Blackout day or Re-Birth Day and I have included this in my schedule for almost two years. The 10 rules of the Re-Birth day. Each rule is important. They are fully integrated while each one has a specific application so try to embrace the process in its entirety. 1. Power down, no gadgets, no work, embrace your aloneness. 4. Travel, get away, even if it is a long walk. 8. Meet one new person during the course of the day. Like any day off, you don’t work or think of work and this gets more interesting. Your phone will be disconnected from wifi, data with voicemail on, or on mute to not get distracted by it. If your daily life requires a phone in case of an emergency like if you are parents, keep it close for an urgent call, but don’t look at it. Your journey will begin with no music at all, no screens, only you, the environment and the natural sounds of everything that you will go through during this special journey. Pay attention to any sound, especially the sound you make, when you walk, when you breathe, your heartbeat when it is calm enough. Don’t work, you have plenty of time to do it the day after. Work and focus on yourself, this is the most important job of the day. 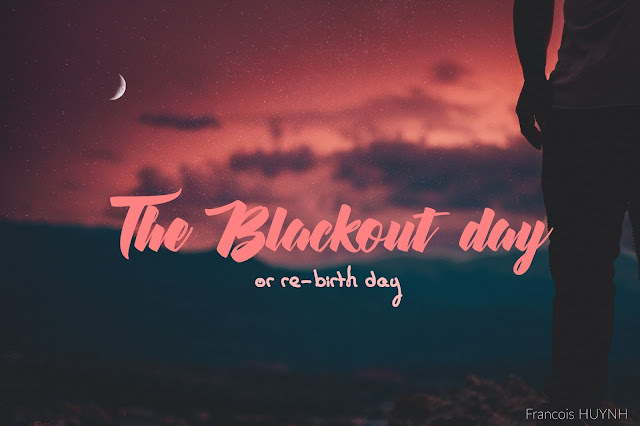 Nobody knows when exactly you will launch your Blackout day/Re-Birth Day and where. This is an essential rule. This is a unique freedom that you can control. Even your spouse or partner and close ones do not have to know where you are. If someone asks you, you can say — I was relaxing, I shut off my phone. You will notice after few months, that even YOU, wouldn’t know exactly what you are about to do, this is part of the therapy. You will embrace the spontaneous moment, the ability to change your mind and motivating your actions with your feelings and not by a hectic calendar or what people expect you to do. You are going to enjoy the surprise of acquainting yourself with the unknown. Do something special, something unique that your memory can place on a timeline and so you can remember it at a moment’s recall. Establish a journal with a few heartfelt notations to keep track of the things you do and the feelings that this day triggered in you. Take a mini vacation to an unexpected destination. Avoid the direct route to your home or workplace. Take the road less traveled. The goal is to get off limits, extend the boundaries of your existence. Discover a place you have never been, discover new grounds. Take the train, bus, plane and go far, far enough to feel your mind traveling through space and time, no matter the distance. While you’re traveling, your mind would feel free of options, you won’t know exactly what is going to happen, you’re going to challenge your inner fears restricting you from enjoying life as it comes. When you travel, look at everything and everyone traveling with you. You will enjoy it, believe me. You can pick some specific places in your life to go by, for example, your hometown, the restaurant you met your significant other or a place you have been when you were a child. I would say this for women mostly, but it is a rule men also need to follow. No cosmetics, hair-do’s. Revel in the natural beauty that is only yours. Of course, you’re going to shower! but don’t put anything on your skin, hair, nails, underarms, piercing, necklaces, watch, NOTHING. A newborn baby does not prepare to enter the new world, neither do you. This is a rebirth do not weigh yourself down with artificial accessories. Attire and shoes should put a premium on comfort. Before you set out on your journey eat a balanced and healthy meal, preferably vine ripened vegetables, sun ripened fruit and anything that is in the season. Have a thermos of spring water with you and take constant sips throughout the designated period. Avoid heavy, greasy foods keep it light and nourishing. Try to follow this rule as a healthy body will better communicate with your mind plus, your stomach will thank you for it. Take a moment to meditate. You can do that while you walk, while you travel, ponder whatever comes into your mind. There is no limit on the amount of time you spend meditating in the moment. Take deep and long breaths, listen to the sound and feel of the air in your lungs and listen as you exhale. A meditation can take 5 to 15 minutes, clearly, there are no limits. When you go to a place you have been before, try to remember how you were, what was in your mind, try to imagine your old self, looking at you and explaining to you who you were. If it was an unpleasant moment attempt to transform this feeling into a positive and new memory, by using the present day and this new approach. Doing this will free your future self from those painful memories and will help liberate you from a heavy chapter of your life. You will try to meet a new person during your journey, who it is is not as important as that it is a new encounter. Connect with a stranger and just talk and take a moment to listen. During my past blackouts, I met great people, lovers for 1 day, a friend, a business opportunity. You are meeting this person when you are in a natural state with contrivance or posing. Even if you look normal, you will experience how simple it is to be friendly, to meet new people and those people will see your aura and energy instead of your style. If you’re single, you may meet the love of your life. You just have to be there at the right moment and follow your heart. After this journey, think about how you are going to feel after this Re-Birth. We will forget about “happy Friday” and “thank god it’s Friday” as an abomination of our modern society. Every time you plan for a Blackout day, check the rules and make sure to follow them. You can divide and do your “Blackout day” in the middle of the month. Try to enjoy the time before the Blackout and after it. You will feel like a reboot of your system every month and will help you clear your mind. Share this method with a person you care about or think that it will help him or her. Explain the rules and send the link, so he/she will understand what to do. Share your experience just by telling briefly how you feel what this experience has given you. Some people have a morning ritual, I choose to have a monthly ritual. This method helps me focus on my personal life, on my businesses and my decisions. It keeps me focused on a daily basis and almost becomes instinctual. It keeps my energy, enthusiasm at a high level and lowers my reaction to negativity. I feel healthy within my body and mind and it helps me socially. And each rebirth gives me a reservoir of inner strength that one day a month helps one tap into.